With climate change deniers in the White House, pollution rules in danger of being gutted, and Republican proposals to cut EPA funding, leaders in the natural products industry are fired up to tackle climate change themselves through the innovative nonprofit OSC². OSC² was conceived in 2012 by Ahmed Rahim, founder and CEO of Numi Organic Tea, and Lara Jackle Dickinson, a natural products industry executive. It began with a conversation about how the industry attracted eco-conscious companies but lacked a mission-driven leader to funnel, organize and expand their efforts to save the planet. “We can all go deeper, and we can all go broader,” is how Dickinson puts it. So in July 2012, Dickinson gathered eight like-minded industry executives at her home in Piedmont, CA, to laydown the groundwork for what would become OSC² with its “One Step Closer 2 an Organic and Sustainable Community” tagline. Five years later, the group is rich with big names in organic and sustainable farming, reforesters and ethical employers: 18 Rabbits, Guayaki Yerba Mate, California Olive Ranch, Nutiva®, Lotus Foods, Dr. Bronner’s Magic Soaps, Happy Family, Gaia Herbs, Estancia Beef and more. These companies lead by example. Guayaki Yerba Mate is a certified organic, fair-trade product sold in biodegradable and compostable packaging. The brand’s mission includes restoring South American Atlantic rainforests. Dr. Bronner’s advocates for fair wages and regenerative organic agriculture, and 18 Rabbits produces non-GMO organic granola and snacks, donating 1 percent of profits to organizations that feed impoverished U.S. children. Sixteen sustainable food businesses make up the core OSC² membership, and they work with dozens more to collaborate, share knowledge, shape and pursue their missions. Under OSC²’s influence, the number of natural product companies committed to the environment is growing quickly. That’s especially true after the first-ever Climate Day, organized by OSC² and co-hosted by New Hope Network at Natural Products Expo West in Anaheim in March. Some 600 people registered for the onsite event with another 1,500 live streaming, and on that day alone more than 30 producers, retailers and distributors committed to help reverse global warming. OSC²’s goal is to reach 1,000 commitments by the year’s end. Ripe is right. 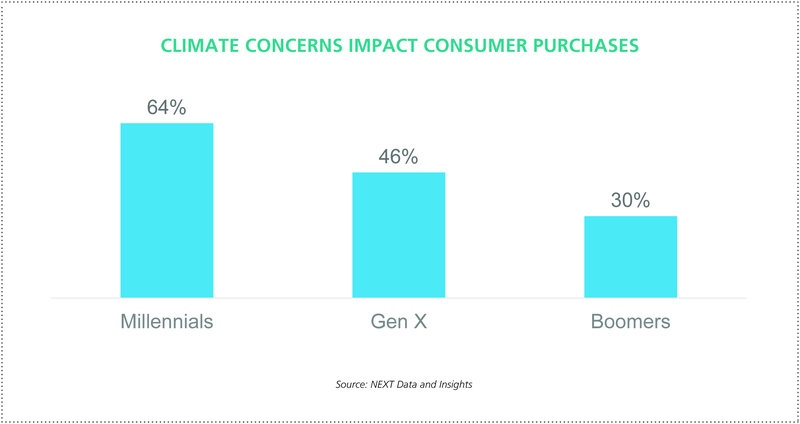 New survey results released by NEXT Data for New Hope Network show a shift in consumer awareness about how each choice at checkout affects the planet. More consumers are willing to pay more for action-oriented brands–those committed to organic farming, waste-free packaging, sustainable agriculture, replanting depleted forests and donating money to nonprofits. The trend started with Boomers and Gen Xers, and now Millennials strongly embrace it. A survey of more than 1,000 consumers showed 60 percent of Millennials said they’d pay more for progressive brands. 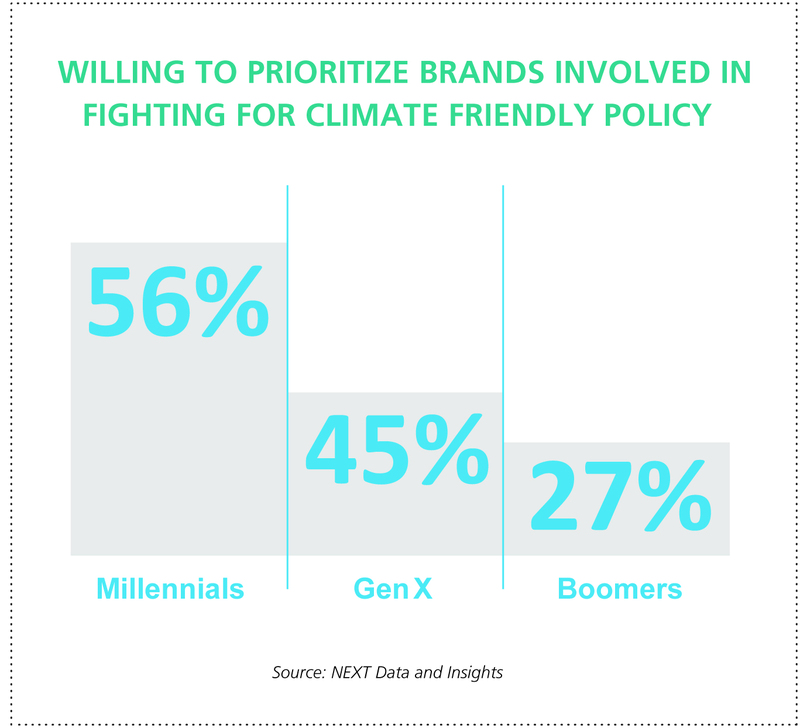 “We have the opportunity right now to connect consumerism to climate action using our brands as a catalyst for change,” Eric Pierce, director of business insights at NEXT Data, said during a Climate Day presentation. The trillions Pierce refers to represents the entire food value chain. In 2015, the natural products industry was valued at $180.6 billion and is projected to grow to $200 billion by 2019. The current political environment is driving OSC²’s urgency for industry action. Robynn Shrader, CEO of National Co+op Grocers, put it this way while speaking on a Climate Day panel: “If the private sector doesn’t do something, we are not only not going to advance the issue but we are going to backslide.” For its part, Shrader’s organization partners with Pur Project to plant forests and reduce its carbon footprint. Moving the industry toward compostable packaging is another major mission of OSC². Think of all the wrappers, bottles, boxes and containers used by natural product producers. They add to the petroleum plastic clogging landfills and waterways. Dickinson pointed to a World Economic Forum study predicting there will be more plastic than fish in our oceans by 2050. The OSC² packaging collaborative, made of more than 30 companies, is developing what they are calling the first compostable, non-GMO plant-based packaging material. “Through the buying power of the coalition with over 30 companies, this has helped grow the demand for this new material, and also drive the price down,” Rahmid said. That’s why OSC² is future-focused on identifying emerging leaders who can carry its missions into the next several decades. In March, OSC² announced the first members of a new “Rising Star” group of young businesses. They include Miyoko’s Kitchen of Fairfax, CA, a producer of artisan vegan cheese out to save the world with a plant-based diet; Kuli Kuli Foods of Oakland, CA, which is helping reforest Haiti with drought-tolerant moringa trees (the leaves are used in Kuli Kuli’s Green Energy Shot); and Square Organics, also of Oakland, which donates part of its earnings to Not For Sale, a nonprofit fighting human trafficking. Rahim is looking forward to the future with these start-ups and under $10 million companies.